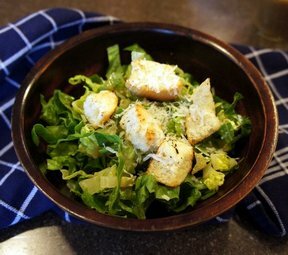 This is the light & healthy version of the classic Caesar salad. As a variation you can add grilled fish, chicken or seafood and make it an entree. To make garlic olive oil, place garlic clove halves in 1/4 cup olive oil and set aside while you prepare your salad and croutons. Cut romaine lettuce lengthwise through the center of the rib and then into 1 1/2 inch pieces. With wire whisk, mix together the egg substitute, garlic olive oil less 1 tablespoon, Worcestershire sauce, lemon juice, salt and pepper. In medium size skillet, on medium high heat, add the 1 tablespoon garlic olive oil. Add the cubed bread and toss until cubes are crisp. To the prepared romaine pieces, add the dressing mixture and toss. 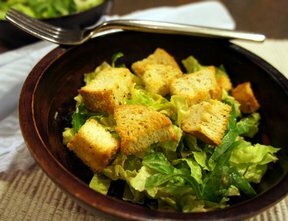 Add the Parmesan cheese and toss together with fresh hot crusty croutons. "This was ok. My family was split on it. 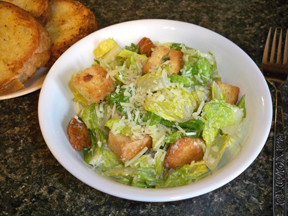 The croutons were a hit (we were lucky to have any to put ON our salads). The dressing seemed to have too much lemon and Worcestershire."